1 What is the Alhambra and where is it located? 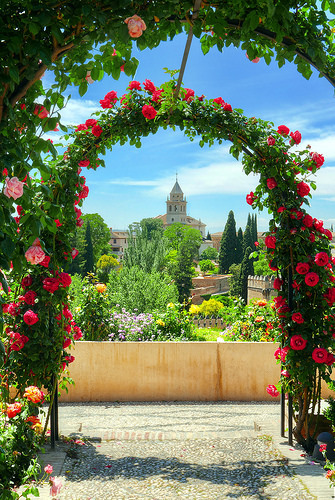 The Alhambra is a complex of palaces built around courtyards of flowering trees, pools and fountains that is often hailed as the most exciting, sensual and romantic of all European monuments. Set on a wooded hill above the city of Granada, in Andalusia in Southern Spain, the Alhambra Palace was built in the 14th century by the then sultans of Granada, rulers of the last Muslim kingdom in Al-Andalus. It reveals the brilliance and spirit of the Moorish culture in Andalusia at a time when the rest of Europe was only just beginning to emerge from the Dark Ages. 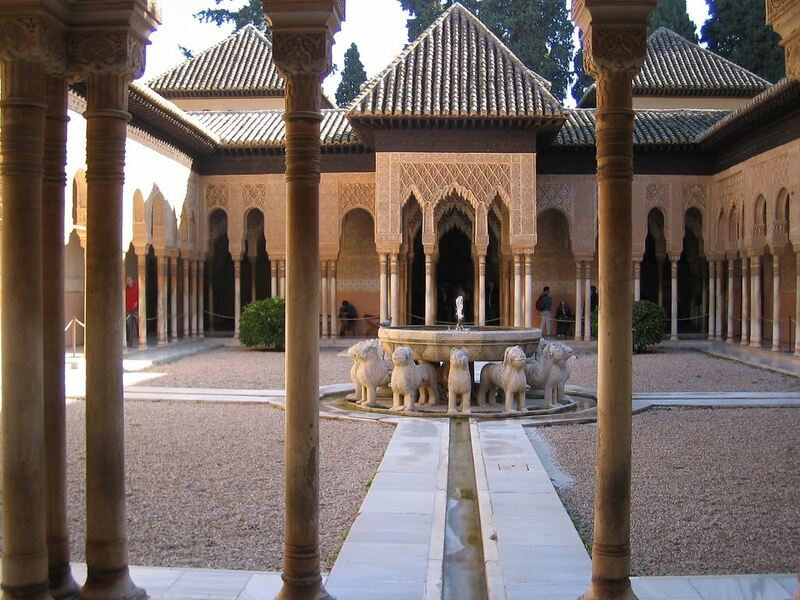 2 Why is visiting the Alhambra in Granada worthwhile? 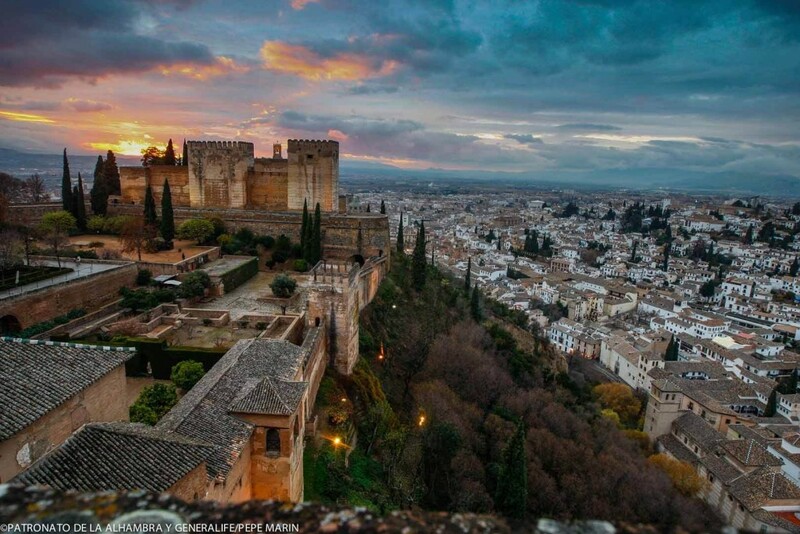 Nothing prepares you for the overwhelming beauty and the scale of the Alhambra which the New York Times says “represents the essence of Andalusia, a historic landmark encrusted with romantic associations”. This UNESCO-listed monument is one of the most popular in Spain and attracted a whopping 2.6 million visitors in 2016. And because the annual attendance is capped at 2.7 million, you really need to plan your trip carefully as daily limits mean that people who turn up on the day without a ticket are often turned away. 3 How do I pre-book tickets for the Alhambra in Granada? Tickets can be booked online in advance but it’s not as simple as it sounds. Take today (a typical morning in late Autumn 2017), we are able to book online tickets for a date in two weeks’ time, although there is a warning on the system that tickets are limited. We need to fast forward six whole weeks to find a day with plenty of tickets. You are probably thinking it’s worth booking well in advance then – say a full year or more. Well, this is not possible because tickets are released in three month blocks. Another avenue for tickets to the Alhambra is the Granada Card Tourist Pass which also books up quickly and releases its tickets in three month blocks – but because it has a separate allocation of Alhambra tickets than the actual Alhambra online reservations, it’s worth a try and makes perfect financial sense if you want to access public transport while in Granada (and a number of other museums in the city). Remember when buying the pass, you must select the date and time for the Alhambra visit. Because we book tickets for our clients all the time, we know all the systems inside out and we have multiple contacts to reach out to for securing tickets. But this is a privilege afforded to few – because the Alhambra limits to 10 the number of tickets that a private individual can acquire in a month – to avoid ticket touting. So, if you are travelling with a few families or a group, you really do need to plan the trip carefully or get onto a professional such as ourselves to do it for you. 4 What else do I need to know when pre-booking my tickets? Remember that you always need to specify the time you want to enter the Nasrid Palaces when booking a ticket. And you cannot miss this slot. You have a window of 30 mins to enter the Palaces from the time you book, otherwise you won’t get in and will have to queue to buy another ticket, if available on the day. 5 Is it possible to get same-day tickets for the Alhambra? We consistently hear of people that turn up on the day and don’t get tickets. Same day tickets sell out quickly and by the time the ticket office opens at 8am, there are long queues formed with people looking for same-day tickets. 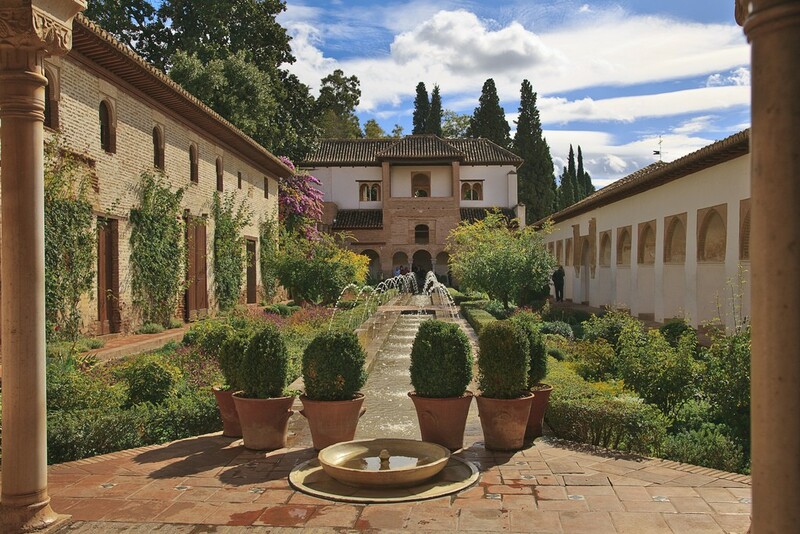 If you don’t secure a ‘general’ ticket that gives you access to the Nasrid Palaces, you have the option of visiting just the Generalife and Gardens. Or you might be offered a night ticket to either the Nasrid Palaces or the Generalife and Gardens. 6 How long does it take to see the Alhambra in Granada? The average visit time is 3 hours but if you have more than a passing interest in art, architecture, botany, landscape gardening, urban planning or history, you might find yourself spending 4 or more hours. 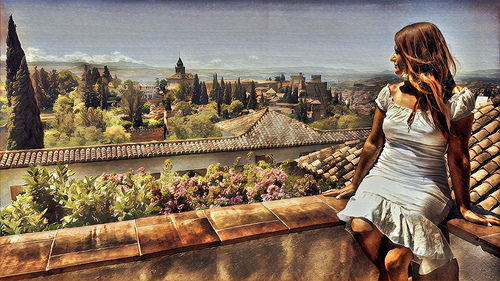 7 When is the best time for visiting the Alhambra in Granada? If at all possible, you want to avoid visiting the Alhambra in Granada during the months of July and August when the days are at their hottest. Our favourite time of year there is in April or May followed by September and October. If you do go in the Winter months, you get to enjoy the views of the Alhambra with snow on the Sierra Nevada which is really special. If you go during July or August, try to get one of the earliest slots and arrive as the Alhambra opens – although you will need an extra layer as the altitude of the site means the air is cool and fresh early in the first part of the day. When it does warm up, make use of the vending machines and the decent café (right at the entrance) to stay hydrated. 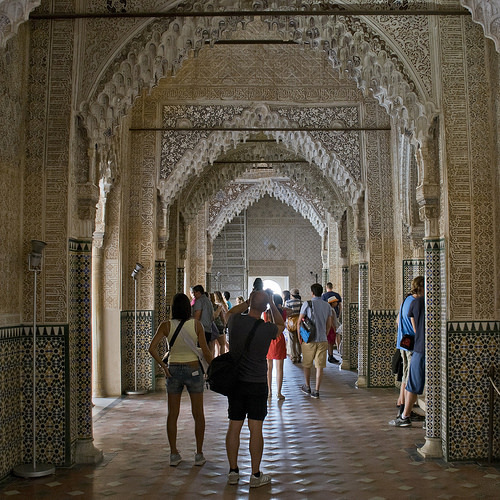 8 What should I wear when visiting the Alhambra? 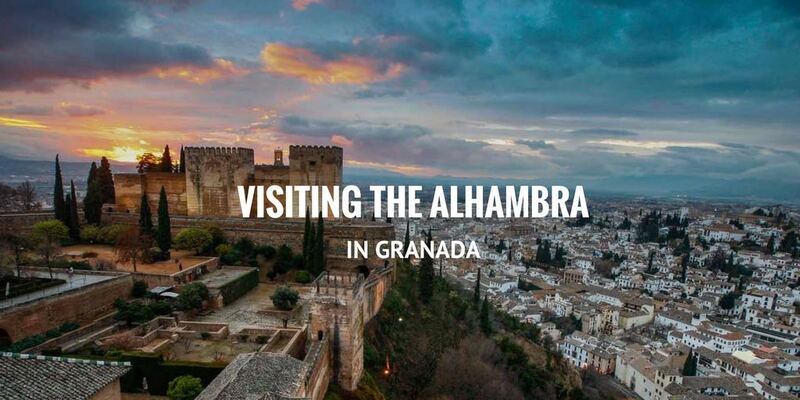 9 Should I join a scheduled tour or book a private guide when visiting the Alhambra? In the Alhambra you can choose to explore the space on your own, join a scheduled tour or join a pre-booked private guide. In our experience, the Alhambra is one of the worst places in Spain to join a scheduled group tour. Groups are very large – often up to 30 people, multilingual, and because your guide will be using a headset, you will be walking around with earphones the whole time. We’ve found that the reception for these headsets isn’t always sharp, the tour feels somewhat rushed, and, questions are not encouraged. “The guide’s encyclopedic knowledge ensured we got maximum benefit from the visit. There was nothing he didn’t know about the Alhambra and his interesting insights into its history, culture, heraldry, etymology, even botany (who knew the religious significance of the 600 seeds in a pomegranate, the fruit which gave Granada its name?) made the visit all the more memorable. 10 Can I park my car at the Alhambra? Yes, there are two large carparks. Although if you are staying in downtown Granada, we recommend leaving your vehicle at your hotel and pre-booking a taxi to get you right up to the ticket office. You’ll also find scheduled bus services from the centre of Granada although for just a few euro more, it’s worth getting ahead of the queues. 11 Is visiting the Alhambra in Granada with young children recommended? Yes – but you might need to plan your visit that little bit more – perhaps encourage them by bringing a small sketchpad and crayons, or a camera to keep them interested – and lots of drinks and snacks as they will be walking quite a bit. When booking tickets, remember that kids under 12 are enter free of charge but you must include them in the reservation. BTW the Alhambra provides free baby carriers (Baby Bjorn or similar) if you’d rather explore without having to negotiate a pram. If you think the crowds might be an added complication, or 3 hours is too long for your family, perhaps you should consider limiting yourself to just the Generalife and Gardens. Again, we highly recommend a pre-booked private guide for families because their knowledge makes any visit so much more entertaining, relevant and personal to each and every member of the family. 12 What is the Generalife? 13 Where can I find the best views of the Alhambra? We often recommend a visit to the San Nicolas viewing point either the day before or the day after visiting the Alhambra itself. You get a wonderful panorama of the complex with a convenient ledge to sit upon if you want to take some family or group poses. But you don’t need to be getting down on a knee to enjoy the moment. 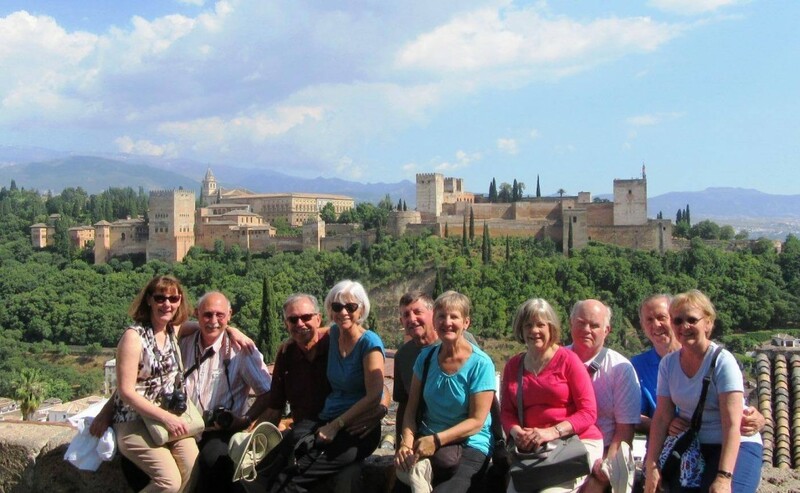 All of private groups love capturing their time at the Alhambra with a photo here. One of our private groups on an extensive tour of Spain captured here in front of the Alhambra in Granada. 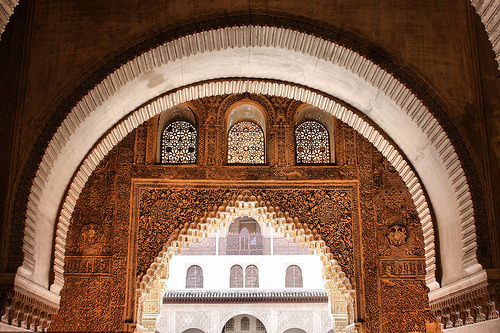 14 Which hotels are best for visiting the Alhambra? As you can tell, we are big fans of the Parador in Granada which is located inside the Alhambra complex. The Parador is a former monastery built on the site of a Nasrid palace. You can trace back its past in the Nazari room but you will probably spend most of your time on the terrace which is especially pretty at night when you can enjoy drinks and meals to the sound of a Spanish guitar with the illuminated Alhambra in the distance. Ask for a room with a view so you can see the UNESCO-gem just before you go to sleep and when you open your eyes again in the morning. Try to book ahead to reserve a table on the terrace as they are always highly sought after! Not only are the views spectacular but it’s such a lovely cool place to sit and have a drink and unwind after a busy morning. If you do find the Parador in Granada is completely booked up, it’s well worth checking out the Alhambra Palace Hotel. Built by the Duke of San Pedro de Galatino, it was opened in 1910 by King Alfonso XIII and is poised to become a five-star hotel. The guest-list reads as a who’s who with royalty, politicians, Hollywood stars and Spain’s own literati having enjoyed the hotel’s hospitality. We like it because it has a wonderful terrace for drinks which is perfect for relaxing after a long day sightseeing – and because the interiors are Alhambra-esque, you feel like you are still on the UNESCO-listed site. 15 What else is there to see and do in Granada? Relax over a refreshing wine or beer and complimentary tapas (yes, free!) in the city’s great bars and restaurants. We can recommend tapas bars and tapas tours for you. Visit the Albaicin neighbourhood (also UNESCO-listed) which is the largest still-inhabited Moorish quarter in Spain and the original site of an ancient Roman settlement. Eat at one of the stunning ‘carmens’ or villas where you are also rewarded with some pretty special views of the Alhambra. Explore underground Granada – and learn about the city from a completely different vantage point – we can book you on a private tour – which is perfect for second time visitors to Granada. 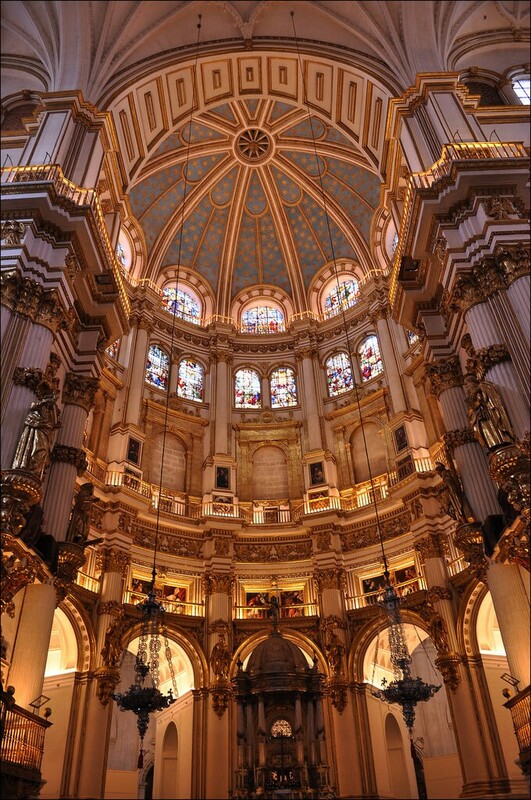 Visit the city’s cathedral where King Ferdinand and Queen Isabella, the Catholic monarchs are laid to rest. Work began on the cathedral in the early 1500’s but it wasn’t completed until 1702! Take a tour of the Realejo neighbourhood also known as the Juderia or Jewish Quarter during the Muslim period of rule and visit the Sephardi Museum of Granada and the Palace of the Forgotten. You can read more about Granada and Spain’s Jewish heritage in our detailed guided here. Dine on a pleasant Moroccan meal in the narrow cobblestoned Albaicin neighbourhood of the city which not only enjoys great views of the Alhambra; its layout harks back to the city’s Medieval Moorish past. There are a couple of gift shops on site but, after your visit to the Alhambra, stroll down the tree-lined hill into Granada, where you’ll find some lovely shops with a better range of gifts at more reasonable prices. Relax after all that walking about at the Hamman Al Andalus baths. If you haven’t tried them in Seville or Madrid, don’t leave Granada without enjoying the hot and cold plunge pools followed by a massage and a mint tea in your fluffy bathrobe. The perfect antidote to all the walking! Posted in Accommodation, General Tickets, Getting Around, Granada, Paradores, Popular Posts, Useful Information and tagged Al Andalus, Albaicin, Alhambra, Andalusia, carmen, cathedral, Generalife, Granada, Mirador de San Nicolas, Nasrid, Realejo, Sierra Nevada, tapas, UNESCO.